Full Moon O Sagashite: I Want You to Hear It! With her first single already a hit on the airwaves, generating many fans, Full Moon is in demand everywhere she goes. However, Mitsuki’s true goal is getting her message to reach her childhood-friend Eichi Sakurai. 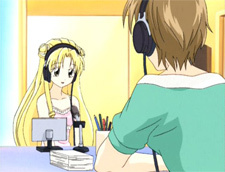 Full Moon’s record label wants publicity in print, TV, and radio, which works to Mitsuki’s advantage if she is to have any chance of reaching the special boy she thinks about. 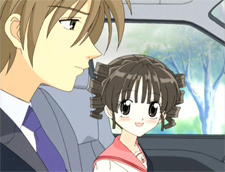 Originally serialized in shoujo magazine Ribon, Full Moon O Sagashite has created a phenomenon. Viz Media brings Full Moon O Sagashite: I Want You to Hear It!, the third volume in their on-going Shojo Beat series, to introduce a new audience to one girl’s dream to touch the heart of a friend she must find again. DVD: Full Moon O Sagashite: I Want You to Hear It! Episode ten and eleven introduce Mitsuki to some of the hardships of being famous. Full Moon has been invited to appear on the show of former-famous-singer Fuyuko Komaki in episode ten. This is a great opportunity, but Full Moon keeps making mistake after mistake on the set. Things don’t get much better with Fuyuko’s sour attitude towards newcomers and the star’s manager causing trouble behind-the-scenes. Full Moon may be new to the world of television, but she may lose her chance to sing at all if the the problems don’t stop. Takuto and Mereko happen to overhear that Fuyuko is only rough on the newcomers because she doesn’t want them to experience the same problems she did. However, there’s still a certain manager to deal with. But the rough business of fame isn’t over yet for Full Moon. 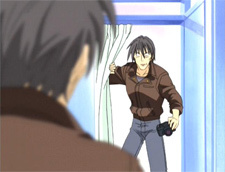 Tabloid-photographer Saegusa is famous for ruining lives with his determination to find out someone’s secrets, and the new starlet with an unkown past is next on his list. Oshige drives Full Moon home after appearing on a radio show, but Saegusa is following closely behind. Takuto manages to change the street lights to delay the photographer while she drops Full Moon off. However, the guy hasn’t given up and quickly finds Full Moon. Mitsuki manages to sneak past the photographer’s lens after a chance to change back into her 12-year-old form, but Saegusa hasn’t given up trying to get his special photos. Mereko receives a special order in her guide book which says that the two shinigami will have to protect Mitsuki from this dangerous man or else her remaining life may be shortened. The final episode is a tad easier on Mitsuki as she and Mereko spend the morning drawing a picture of Takuto. Mitsuki’s drawing is for class while Mereko just wants to show how much she loves the shinigami who ignores her every approach at showing him affection. Takuto takes a look at the drawing and insults Mitsuki’s hard work. 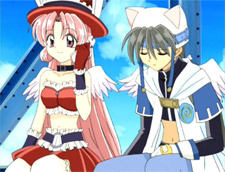 Tired and unhappy with the drawing, Takuto takes off with Mereko following to try and calm him down. Meanwhile, an old man wanders by the Koyama residence before collapsing. Ms. Tanaka notices the fallen gentleman and rushes him inside for a meal before a terrible rumor starts. As thanks for the meal, the old gentleman gives Tanaka a Saint’s Stone. Grandma Koyama sees the stone and instantly insists Tanaka get rid of it. Unfortunately, the Saint’s Stone carries a special barrier inside to keep shinigami out of a residence. The moment Ms. Tanaka places the stone around the garden pond, a barrier is created around the complex. Mereko manages to calm down Takuto, who has figured out how rude he was to their special friend. The two head home but the barrier prevents them from entering the Koyama grounds. 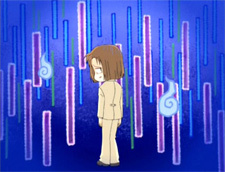 They try to contact Mitsuki by phone and letter, but the barrier prevents any communication from the shinigami from reaching inside the complex. And to make matters worse, Full Moon has an appearance that day and she won’t be able to make it if she can’t become Full Moon. Full Moon O Sagashite carries your standard shoujo-magical-girl requirements, like fluffy stories, endings with a special message, and some filler-episodes to lengthen the time it takes to reach the end goal of the series. While there are some advancements in the plot, they’re only little things that give us more of a background for some of the characters, like the fact that Takuto and Mereko used to be humans long ago. Half of these four episodes can be seen as something good and the other half as filler until the next big event in Full Moon’s career. It’s not a bad thing, but I don’t like being teased with new details and then pushing on to something far less important for a little while. The animation isn’t as high production as some other series during the time the show was being made, but the character designs stand out very well as being cute. The Japanese cast continues to do fairly well with the three regulars: Mitsuki/Full Moon (myco), Takuto (Yasuo Saito), and Mereko (Chieko Honda). Yet the minor episodic characters are a bit flat for my tastes. There isn’t much for them to work with, but it still could have been better in at least three of the episodes. The English production from Blue Water Studios continues about where it left off last volume with nothing above average and some occasional low-notes with the supporting cast for Mitsuki. Overall the script stays fairly faithful, but the cast still seems to need time to warm up to their characters. Katie Rowan, no stranger to musical magical-girl shows, does a good job as the title character and is worth checking out, so not all is lost. With a little more time, this cast can still create a solid title before getting through a third of the series. Full Moon O Sagashite: I Want You to Hear It! isn’t as sharp as the last volume, but there are still some good things to be found within the episodes. It’s not a show for everyone, but there is a strong Sailor-Moon-based generation of girls who would eat this show up if they knew about it. It would also be a good choice of series to introduce to new fans – especially young girls – who are looking for something to relate to. Viz continues to do a good job with the video quality, and the subtitles are flawless as one should always hope to see. The j-pop-idol-infused storyline of a dying girl trying to live her dream and touch the heart of a boy she once met long ago makes the show far better than some of the previous entries into the genre. Full Moon O Sagashite: I Want You to Hear It! is a bit heavy on the filler, but still is something to check out when you have the time if you’re curious about the show. Brick-and-mortar stores seem to carry only a limited selection, if at all, so make sure to try an online retailer first if you want a better chance at finding a copy.